At a brief 185 pages, November is a story about a tragedy involving a family of four: a mother, a father, and their grown adult children - a brother and sister named Olivier and Laure, the latter of whom is the narrator of the story. Olivier and Laure's mother is a pathetic alcoholic who is bitter at the world as a result of her apparent physical ugliness. Their father chases after the family's Spanish maid Manuela, who is also Olivier's object of affection. As the all-knowing witness of this story, Laure relays her brother and father's affair with the maid, while watching her mother drown herself in alcoholic misery. Meanwhile, Laure carries on with her own affair with her married professor at work. When Manuela abruptly quits working for the family and goes missing, Laure begins to speculate about Manuela's whereabouts, and does some sleuthing of her own. What she learns has devastating consequences (or does it?) for her family. 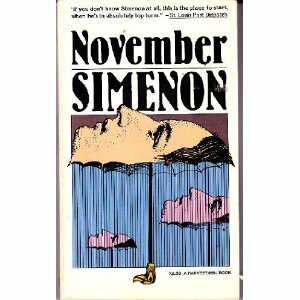 As usual, Simenon's quirky, yet blunt and matter-of-fact style makes November a bizarre and entertaining read. Since the novel takes place in France (as do most of Simenon's novels, which are translated from French into English), American readers will delight in this book's languid, cultural setting. The novel is unsurprisingly predictable, which is, in reality, wholly irrelevant - after all, you'll be reading November for Simenon's prose and character-driven premise - not for the plot. I'll admit - there is one particular element in all of Simenon's novels that never fails to surprise me, and it's the ever-present feeling of timelessness in all his novels. The subject matter of each novel, as well as Simenon's writing style, is contemporary and modern no matter what the time period. When I pick up most of Simenon's novels, I feel as if I'm reading a new release. Weird, right?! But you wouldn't believe me unless you read his novels yourself! 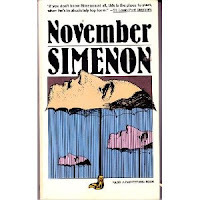 If you're a fan of Simenon, or just quirky fiction in general, you'll definitely like November. Keep in mind though, that Simenon's standalone novels have a completely different tone from his Inspector Maigret novels. Some of my other favorite novels by Georges Simenon are The Cat (1972), Aunt Jeanne (1953), Across the Street (1954), The Iron Stair Case (1963), and The Train (1964). What are your favorite novels by Georges Simenon? Which other authors or books does his work remind you of? Share your comments with us below!